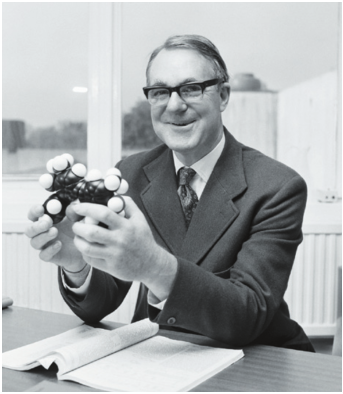 The 8th December last year saw the unfortunate passing of Sir John ‘Kappa’ Cornforth, winner of the 1975 Nobel Prize in Chemistry, and emeritus professor here at the University of Sussex. Cornforth made his name in the field of chemistry by studying the mechanisms by which chemical reactions occur in the body. In particular, he studied the biosynthesis of cholesterol, with pioneering experiments using intermediates radiolabelled with carbon-14. Using this technique, he correctly identified each of the 14 biosynthetic steps at a regio- and stereochemically precise level. This work led to the awarding of the Nobel Prize in 1975, “for his work on the stereochemistry of enzyme-catalyzed reactions”. 1975 was also the year that Cornforth was awarded a professorship at the University of Sussex. This marked a subtle change in the direction of his research; he was given the ambitious task of designing a compound to act as an analogue for the enzyme hydratase. This practice of mimicking life with science is one that has engaged scientists for centuries, from wildly ambitious Victorian attempts to recreate life using electricity, to modern research directed by our ever-widening understanding of biochemistry. The use of biological mimetics within medicinal chemistry is a fairly obvious one. If analogues of biological molecules, such as DNA or polypeptide secondary structures, could be effectively used to target their respective protein binding sites, then we could utilise this to design competitive inhibitors of a wide range of therapeutic targets in the body. The ever growing body of publications demonstrate our continuing advancement in this area. The Tavassoli group at the University of Southampton made recent headway in the field of DNA mimetics, with work identifying triazole groups as possible bioisosteres for phosphodiester linkers in a synthetic DNA backbone (Angew. Chem. Int. Ed. 2014, 53, 1 – 5). The group has been carrying out work on the hypothesis that the ‘click’ chemistry associated with triazoles could be integrated into DNA synthesis, providing a potential tool for joining two individual strands of DNA. The work discussed within the paper builds on previous work carried out by the group, and tests the biocompatibility of click linked DNA plasmids in human cells. In order to test this, the Tavassoli group synthesized a plasmid containing a ‘click-linked’ mCherry fluorescent gene. The plasmid was then microinjected into a breast cancer cell line (MCF-7), and incubated for 24 hours. After the incubation period, approximately 90% of the cells exposed to the mCherry plasmid were found to display the red-fluorescent phenotype associated with mCherry expression, demonstrating that the triazole group is tolerated as an alternative to phosphodiester linkers by human DNA transcriptase enzymes. The plasmid used only contains one ‘click’ linked triazole isostere, but it will be interesting to see to what extent the phosphodiester bridges can be substituted before the synthetic plasmid is no longer tolerated by the cell. Could techniques like this affect DNA synthesis in the laboratory in a similar fashion to the impact native chemical ligation first had on polypeptide synthesis? A full obituary of Sir John Cornforth written by emeritus professor Jim Hanson and published in Nature can be found at http://dx.doi.org/10.1038/506035a.